Q : How was it working on a set that you didn’t have everything on? 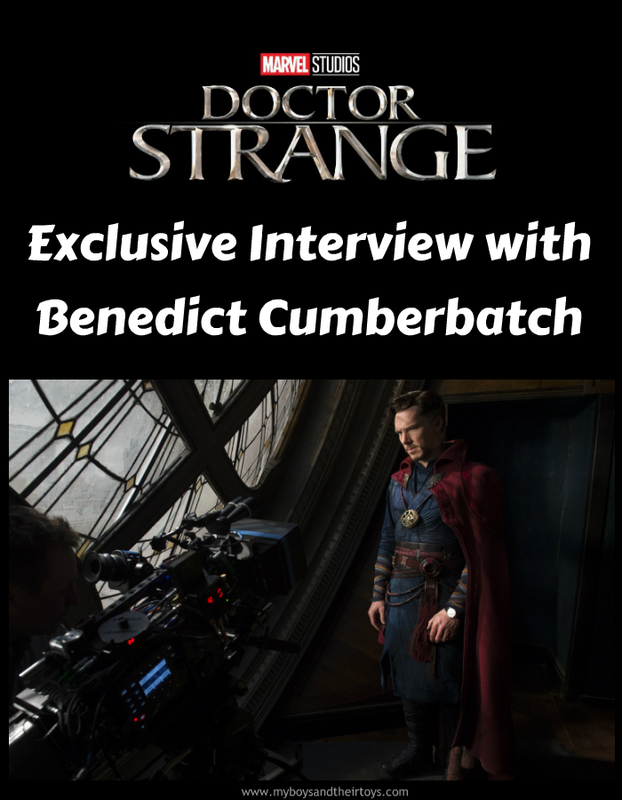 Benedict Cumberbatch: Well, I mean the thing about the set it’s a huge mixture. Sometimes on Marvel you have rooms with cameras doing 360 frames you can use within the film. And then other days you are literally in a room where the walls, the floors, everything but the ceiling is diffused light, it’s green or blue. And you don’t know what time it is, you can’t get horizons or space right. It’s very, very confusing. But, you know, you have this incredibly complex preface which is cartoon format. It’s sort of story boarding. And so you know exactly where you are, exactly what elements or environments are gonna be moving around you, and then it’s the same old game of acting. You just turn up to eleven. You know, everything we do as actors is imaginary circumstances. It’s a form of artifice and smoke and mirrors. Even if I would walk into this room with a hidden camera – at some point you understand that you’re walking in a character you may be keeping and in order for somebody somewhere to see it. So there’s always in the back of your head the idea that you’re being watched or you’re performing. The hardest stuff is sometimes doing the movement, or the spells, or anything to do with what are his powers involved or the weapons he used. So it’s just magic stuff out of the air, literally, to fight with the times. Obviously some of the relics he uses, especially the cloak, they animate, but, not on the day. Q : Speaking of your cloak, what was it like and how long did it take to get into costume? 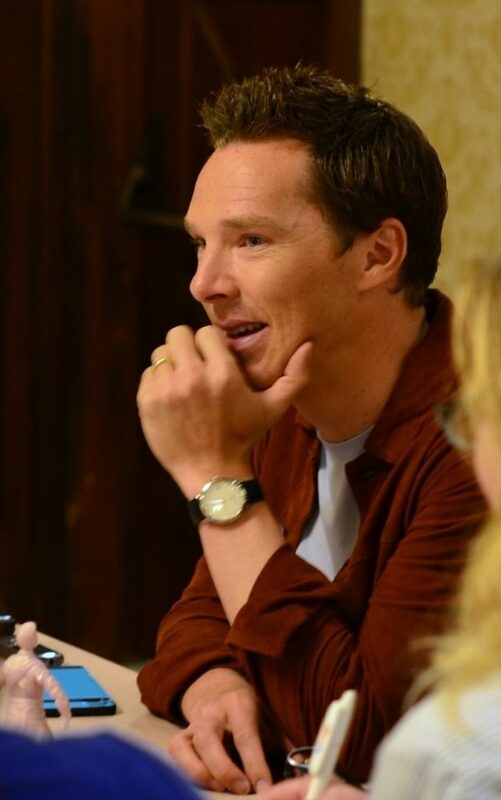 BC: Oh, well I felt like a kid. I mean it was just amazing. It was the first proper moment when I thought, oh my God, I’m actually playing a superhero! There’s nothing like it. It was really, really giddy. We’d been trying a lot of the costume on for about – I forget exactly the time, but something like a month. But a lot of the civilian stuff at the beginning, and this was a deterioration of that and his journey. And then with the costume proper just very slowing it’s grading up to what you see at the end of the film. Q : How long did it take to get into costume? BC: Actually Nick was brilliant my costume guy. I mean ‘cause you really do need to become clamped into it. It took us about twenty minutes to half an hour. The boots were the longest thing, actually. The boots were the longest thing ‘cause those are real laces. It’s not Velcro. Alex is brilliant at this and she studied a lot the design. And so there was a lot of stuff that early on I went, there’s no way I could do this movement. So that got elasticated. And also getting stuff on with prosthetic, and my arm and my hand sometimes the cloth would just be working the makeup off. So that had to be elasticated with the sort of details around the arms here. So we just refined it and finessed it and that was the same through production. So I’d say the fastest we got it was about twenty minutes. Q : Can you tell us about the audition process and what your reaction was when you got the role? BC: This started with a conversation with an LA Times journalist, I think, and he sat on the roof of Bad Robot when we were doing Star Trek press. You’d make a great Doctor Strange. I went Doctor Who? And he went, no, that as well…then I was intrigued. And I read it a bit and I thought okay, I can sort of see why he meant that. But this is very much a comic of its time. It’s about cultism and east meets west mysticism, you know, in the ‘60s. And it’s got all those sort of psychedelic elements, like real big left turn that they did with his drawings which was just mind-blowing. And then Kevin and Steve called and I went in for Marvel and we had a proper grown up discussion about it. And I was like okay, this could be really interesting. Most importantly was when I sat down with Scott and I gave him a few of my concerns about the onuses of the character, how sort of acerbically arrogant he was. I thought I play other elements of that in other characters as you probably know, and I wanna just round the edges a little bit. Make him more human, understand what makes him who he becomes. He pitched the origin story and that humor was gonna be really important to him. He just won me over and I really like Scott as a person as well. And I have to admit, I’ve never seen one of his films all the way through because I’m terrible at watching horror films. I can’t do it. It affects my imagination in a really bad way. But I have seen a lot of his previous work, and the combination was intoxicating and I was just won over. They wanted to film it right then, but I was doing Hamlet. So I couldn’t. And it went away for a bit and I was heartbroken. Then they came out and said we can’t not make this film with you. We really need it to be you. For the first time ever in Marvel’s history, they postponed the schedule of the making and the release of the film. Which was amazing. And that, from the ultimate fan boy Kevin, was a particularly amazing thing. It meant I had a huge amount of responsibility to live up to their faith in me, but that was a great motivation. Q: So what is the wildest thing you’d love to see your character do in future films? BC: Oh God, the sky’s the limit. I mean this guy defends our reality against other dimensions. So it’s pretty hard to stop at one thing. Obviously I know it might be a bit of a leering question to see who I’d like to work with in the Avengers movie. But the truth is all of them. I know a little bit about what who I will be working with. I’m very, very excited about that. It’s hard to say without then giving stuff away. Q : Did you have to go through special classes? How did you prepare? Did you have to go through training and actually go through repetition of certain things? 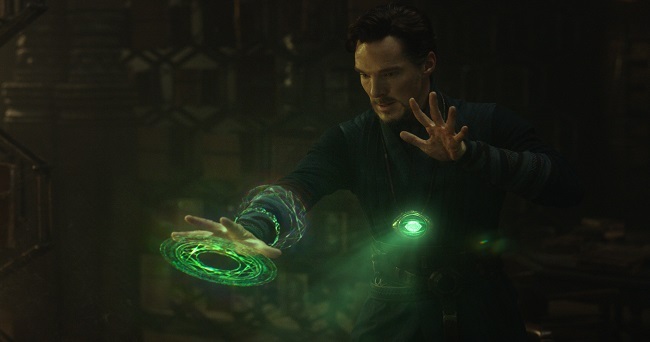 Benedict Cumberbatch: Well, for the specifics of the spell casting, yes, there was this fantastic guy called Julian who’s a world class tutting, which is this hand movement thing. It’s very specific to the fingers. All the rest of it was sort of evolved with everything from Tai Chi to Kung Fu, to the fight style, so the tutting is sort of a dance thing where we’re going through the routine, that then evolves into his fighting style. The biggest thing I do and sort of accomplished was the gymnastics. The aerial gymnastics for the wild work I did in the stunt scenes or the flying or being catapulted backwards through endless glass cabinets. And it was tough. I won’t lie. But it was really enjoyable. I mean, you have the best people. Whether it’s someone helping you with the dart. And I was training every day, or every other day, just to get my body in shape and to be fit enough to do it. Then yoga to make sure the body was supple enough. Then doing martial arts. Then doing stunt choreography for specific fight scenes. And then doing wild work and other sort of specific sort of stunts, um, stand alone moments like the moments where the room’s ticking or the floor becomes the wall, and the end of the corridor something becomes the ceiling. That was me doing it. Great fun. Tomorrow I’ll be sharing our exclusive interview with Rachel McAdams. That’s another great interview, so be sure to look out for that! 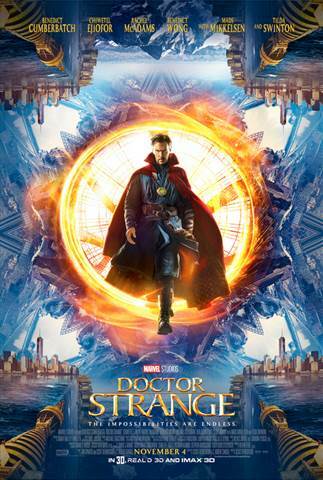 Check out the Doctor Strange trailer below, and don’t forget the film – starring Benedict Cumberbatch – is in theaters everywhere November 4th! What a fun opportunity this must have been. Great interview. My son is really wanting to see this movie. Thanks Shelly 🙂 Yes – so fun!! That was really interesting what he had to say about acting being a bit like a game of smoke and mirrors. I guess I knew that’s true, but it makes him seem a bit like a magician and an actor rolled into one! I love reading behind the scene interviews of the new movies. It gives me a sense of a connection to the movie. I can’t wait to see this movie. 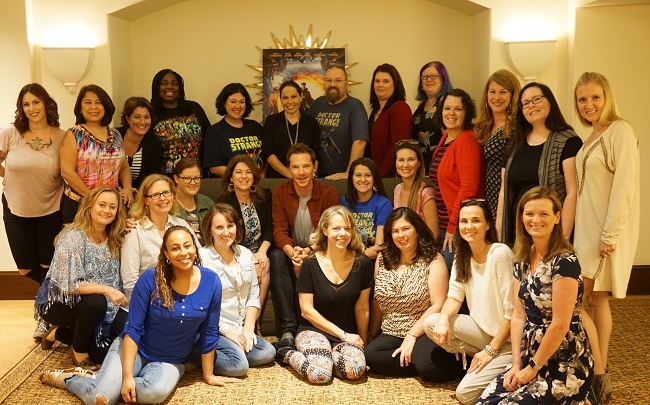 What a great experience it must have been for you to meet the people in the film. What a great opportunity this must have been. Great interview. My son really wants to see this movie! Haven’t seen the movie yet, but what a great opportunity!